Buying saw blades and router bits is getting more confusing by the day. That’s because cutting technology is moving along at such an incredible rate, and so many manufacturers are promoting their proprietary geometry, coating or carbide as the absolute state-of-the-art. In many cases, they’re right … at least for a while. The more data that designers can harvest from testing, the more refined and sophisticated their newest offerings become. And the technologies of Industry 4.0 deliver a lot of data. All that engineering creates a constant challenge for woodworkers – we don’t want to miss out on any advantages, but we also don’t want to be unwitting guinea pigs that end up beta testing new products on actual jobs. 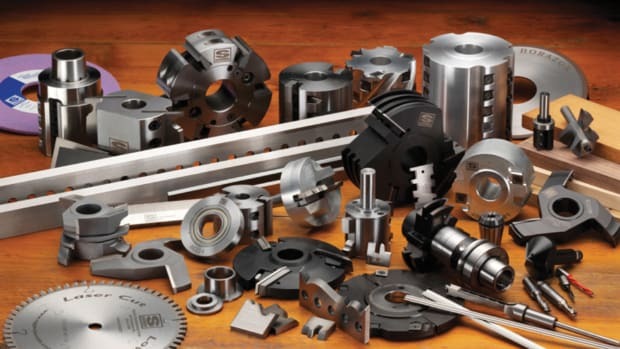 That’s a genuine concern in a global economy where imported tooling has flooded the market, and many tried and true, trusted industry names have gone through corporate rebranding after mergers or takeovers. It’s hard to know where the goalposts are anymore. Take, for example, the thickness of saw blades. 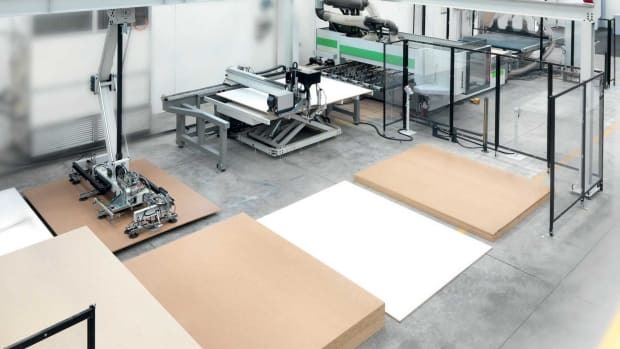 When thin kerf technology first came along, it had a lot more to do with saving stock than getting cleaner cuts. Now, thin kerf blades are being primarily marketed as operating faster, with less resistant, cooler and smoother. From a stock-saving viewpoint, the more a shop cuts, the more sense a thin blade makes. Save 1/32” a million times over and you’ll have enough lumber to build a treehouse. And because of that, thin blades have become a high-volume production tool. Their inherent weakness, a lack of mass, has diminished because they can now rely in part on the bulk and precision of larger machines and accurate feed systems to let them stay in their plane without distortion. 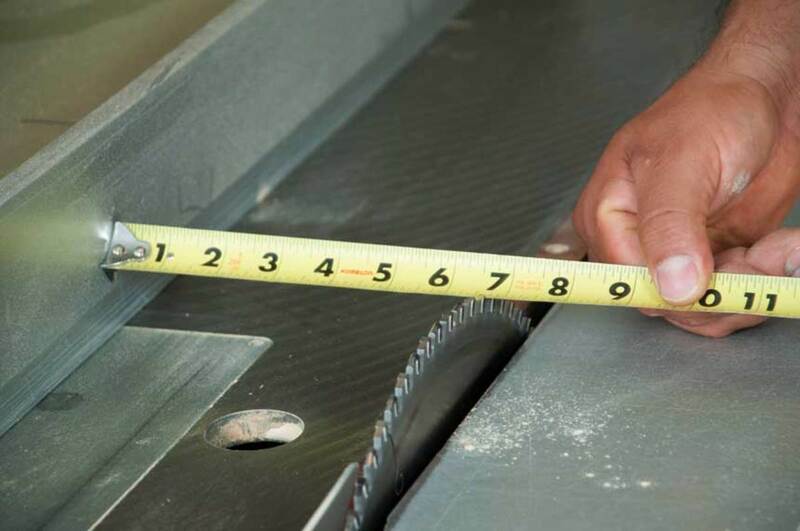 But smaller shops will still find that, in most cases, thin kerf blades operate a whole lot better on traditional machines if they’re equipped with dampeners or stiffeners. The nature of carbide is also confusing. Whether a bit or blade has brazed tips or inserts, the carbide quality always seems to be a selling point. Manufacturers list it as C-3 or perhaps C-4, but such nomenclature means little when the industry has no regulated and imposed standards for determining these grades. Micro-grain carbide is another subjective term. In reality, it can mean whatever the salesperson wants it to mean. How small is a micro? 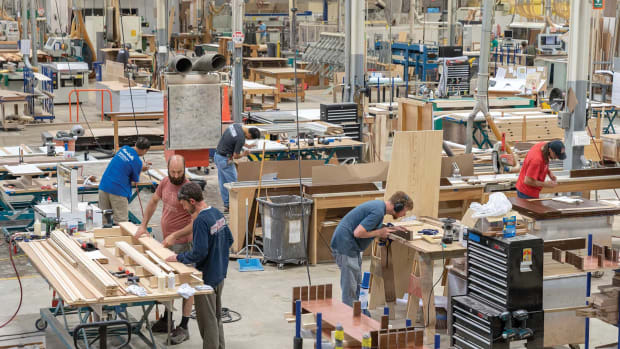 So, rather than sorting through conflicting claims and constantly shop-testing bits, woodworkers are probably best advised to place their faith in people rather than products. That means finding a supplier that trade associations and large producers trust. The most ideal of these may be companies that produce their own carbide and control the entire manufacturing process in-house. And they’ll have history behind them. Sintered carbide is another gray technology for woodworkers, but it is a little more specific. The word describes a compound with various carbide grains that are bound at a temperature that equals the lowest melting point of the various components. That is, the grain that melts first becomes the binder. This allows the factory to include a mix of grains to meet specific objectives. It is an aspect of the tip’s properties that a woodshop should discuss in detail with a blade or bit salesperson, if large amounts of specific materials are to be processed. For example, the perfect sinter mix for laminates would be different than the one for MDF or birch ply. One of the more sophisticated technologies that has become widely available to small- and medium-sized manufacturing facilities is Electrical Discharge Machining (EDM). It uses a pair of electrodes to shape metal. There’s one on the machine and another on the part, with a gap between that hosts a dielectric (blocking) liquid. The easiest way to understand it is that increasing the voltage that passes between the electrodes weakens the metal and breaks it off. The entire process can be numerically controlled. The advantages of wire EDM tool making include the fact that it can handle harder metals than traditional cutting and grinding methods, and it can also create very intricate and precise patterns. 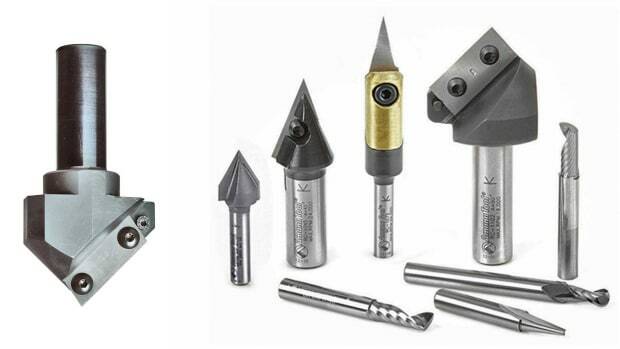 What’s of special interest to woodworkers is that many specialty tool suppliers are switching to this technology, so they can deliver more customized parts that are also of higher quality. And the finer precision allows designers to come up with some interesting variations, such as complex anti-vibration slots that reduce chatter and the need for stabilizers or expansion slots that reduce noise and dissipate heat. 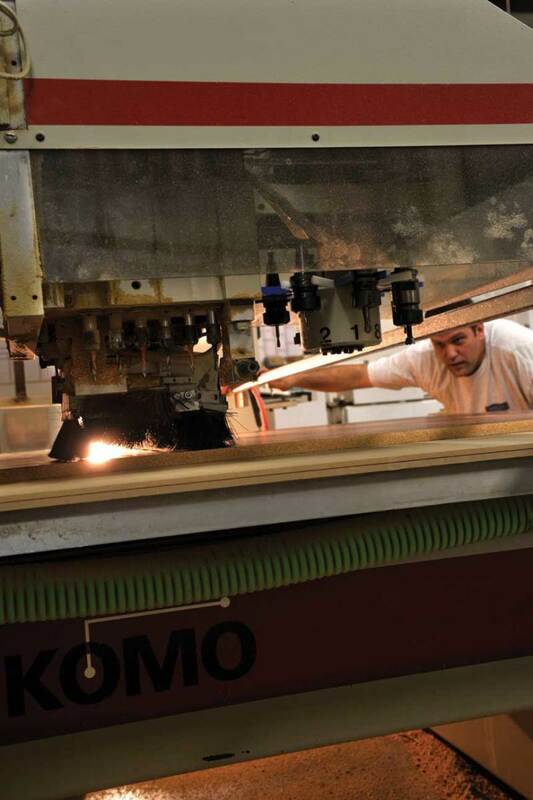 Another technology that makes manufacturing more precise is laser cutting. 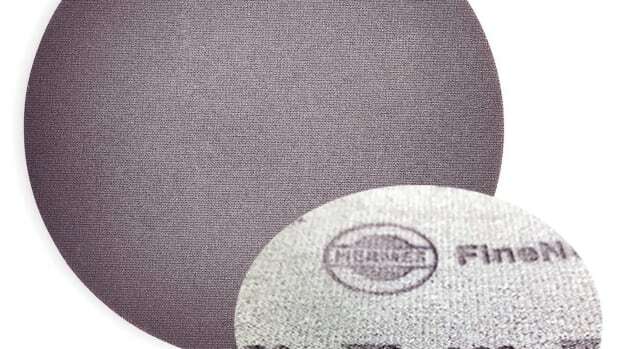 Several factories say that this process is less stressful on saw blades, so it delivers a flatter product. Such capabilities open the door to making minor adjustments that can actually have a large impact on quality, speed and sometimes both. For example, there’s a relationship between face hooks and feed speed that can be endlessly tweaked to produce the cleanest crosscuts. This is of special interest to woodshops that are more concerned with exquisite quality than raw speed. They can feed slower for a better cut. The theory is that, if the blade cuts cleanly enough to eliminate the need for touch-ups, then the overall investment in time is a wash. That’s fine for custom cabinet shops, but not so inviting for outsourcing suppliers who need to deliver hundreds of cases a day. 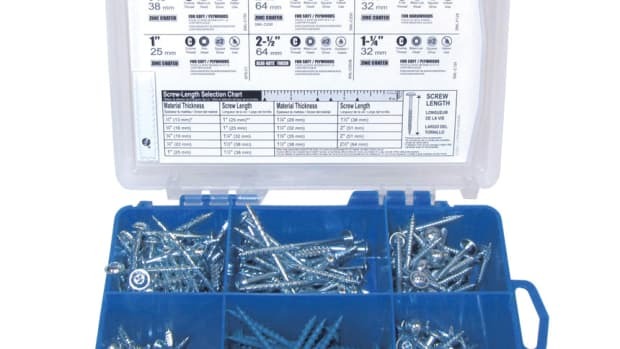 Woodworkers should pay attention to the fit and finish of bits and blades, too. The bore hole or shaft needs to be clean, so changeovers are quick and smooth. The carbide or other tips need to have a full, even bond, so they are all able to absorb the same impact. Ever see a cheap blade where a few teeth are missing? And the face of a blade or the shaft of a bit should be smooth, clean, polished and flawless, especially when using tool changers. If the manufacturer failed to meet these basic standards, the factory also probably failed to pay sufficient attention to such rudimentary requirements as straight and flat. 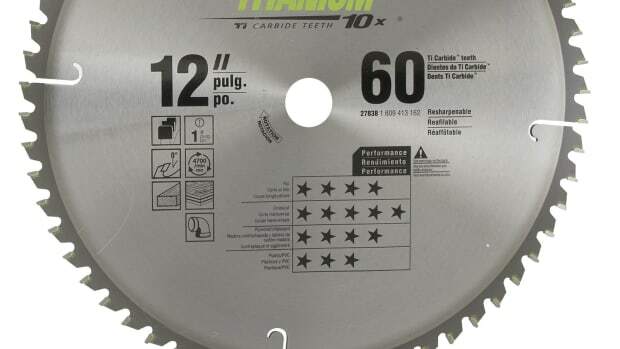 Diamond saw blades are ideal for solid surface, laminates and other materials that wear hard. Diamond-tipped bits and blades don’t dull quickly, so they maintain not just the edge but also their profile. That delivers crisp parts, minimal tear-out and, above all, consistency. On large jobs, the first part off the machine can be identical to the last one, and that will save a lot of touch-up time. Their ability to hold an edge also makes them initially more expensive, but over the long term quite competitive. Less sharpening and re-tipping also saves downtime. Ceramics somehow haven’t yet assumed the role that most prognosticators predicted a decade or two ago. These malleable, versatile materials have the strength and tenacity needed to create superb bits and blades, but not the brittleness. They can hold an edge but they can’t take one. Steel and carbide can be made much sharper. Cermets are metal and ceramic hybrids, and in bits and blades they usually have a nickel chrome binder. A few years ago, Forintek, a Canadian company involved in treating, preserving and harvesting wood, tested cermet tips against carbide in Western red cedar and discovered that cermet stayed sharp about four times longer. Saw blades manufactured with Cermet II tips tend to deliver a better edge than standard carbide-tipped blades, stay sharper longer, and are more resistant to tip fracture. That’s because they’re more heat resistant than carbide, so they cut at faster feed rates without harming the saw blade or burning the wood. They can be ground just like standard carbide blades, so no special sharpening set-up is needed. 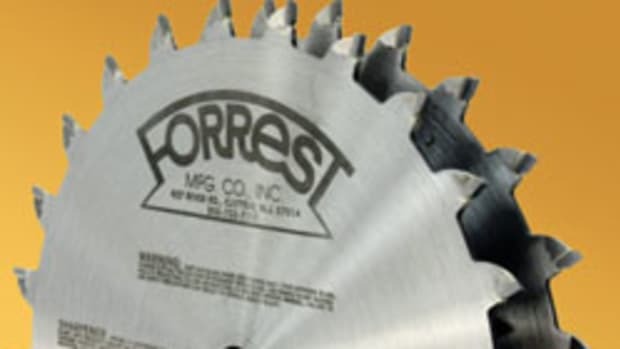 A long time ago, toolmakers realized that saw blades and router bits had a basic design flaw. When they go to work, they get hot. And the other side of the coin is that the materials they are cutting or shaping do something completely unfair when the tool makes them hot. 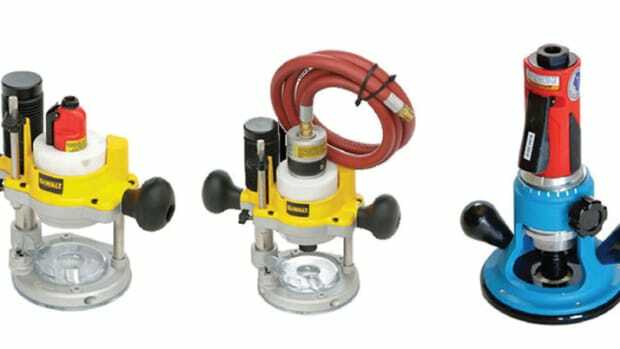 They release resins or melted plastic that eventually sticks to the cutter and builds up. That creates drag, which creates more resistance, which creates more heat, which of course creates more residue and build-up. Once a blade starts getting gunky, the process is a geometric progression – it happens faster. The original coatings designed to prevent build-up were little more than paint, and many of them actually made things worse. But manufacturers stuck with the idea, and today there are all kinds of patented non-stick, heat resisting coatings that change color, or lubricate, or just plain look pretty. Most of them work well and do the job they were designed to do – but they are rarely asked to. That’s because the carbide tips are wider than the saw plate, so the only time that most of the coating is tested is when the wood binds. Coated tips can lose their protection because these are small areas with little mass that get extremely hot, and the bond fails. And sometimes your bit and blade sharpener actually removes the coating to service the tool. Still, there is an argument for buying coated cutters, especially if the woodshop is anywhere near an ocean or in a humid part of the country where rust is an issue. And specialty shops such as sign-makers often swear by coatings because their machines are working with more than just wood (foam, non-ferrous metals, plastics, etc. ), and the added lubrication delivers cleaner cuts and longer life.